This first week of December usually starts the party season that lasts until the New Year. For those of us who have worked so hard to be healthy and fit during the year, this can be a challenging time to stay true to our goals. One of the most difficult situations seems to be the never ending list of parties and get togethers. However, parties don’t have to spell the death of all our hard work. Learning to moderate alcohol consumption can go a long way to helping us be mindful of our goals. Here are some ideas to moderate alcohol consumption. Set a limit. Before you leave for a party, decide how many drinks you are going to have in that night and then stick to it. Two to three drinks seems to be an appropriate limit for most people but know your own tolerance. Alternate alcohol with water. Follow every cocktail you have with a full glass of water to slow down your consumption and keep you hydrated. Don’t drink on an empty stomach. Fill your belly with good quality, healthy food before you start drinking to slow the absorption of the alcohol. Avoid shots and/or sweet cocktails. 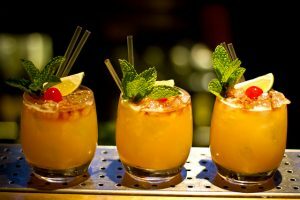 With both shots and sugary cocktails it is hard to keep track of the amount of alcohol you are consuming. Put your drink in a cocktail glass: Putting non-alcoholic drinks in a cocktail glass can make them feel fun and festive without the side effects of alcohol. If you follow these tips and still find yourself feeling a little drunk, be sure to drink plenty of water, try to get as much sleep as possible and eat a hearty breakfast in the morning to combat hypoglycemia.